A few months ago we were approached by a Cambridge based landlord to work on a large new-build flats project. 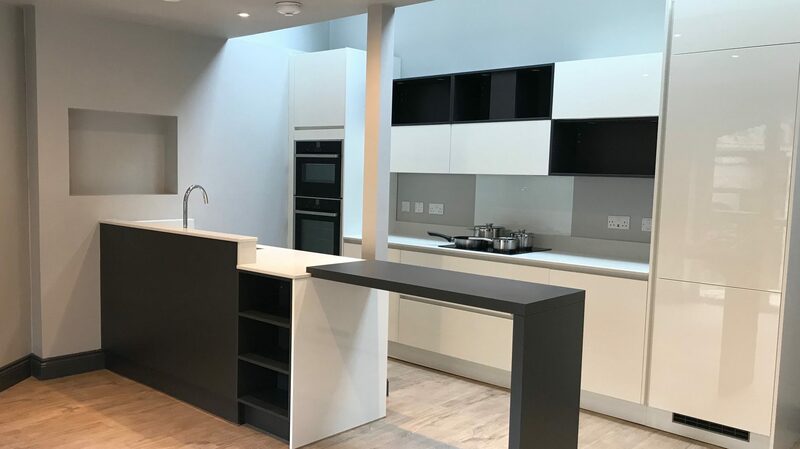 The project, located less than 1 mile from our Cambridge Showroom, was to design and install three bathrooms and kitchens. 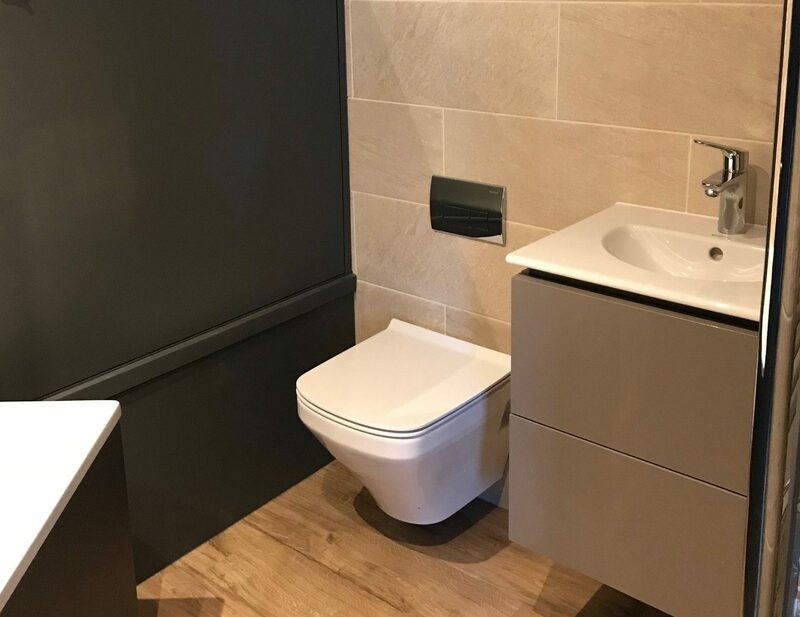 These kitchens and bathrooms needed to be designed to suit young professionals working locally, therefore it was felt that they should be of modern design, with a focus on making the spaces feel light and open as possible. For the bathrooms we used Duravit’s Darling range. We’ve worked with this company for many years now and their products give us a really good quality bathroom that look incredible. The materials they use for their products mean they can create beautifully curved stylish design, but be robust enough to last for many years. This was complemented by Hansgrohe’s high quality brassware from their Focus range. Above the basins we installed mirrored cabinets, which had modern features such as LED lighting and internal shaver socket. Amtico was used for the flooring throughout the flat, this also helped bring the whole design and flow of the flat together. 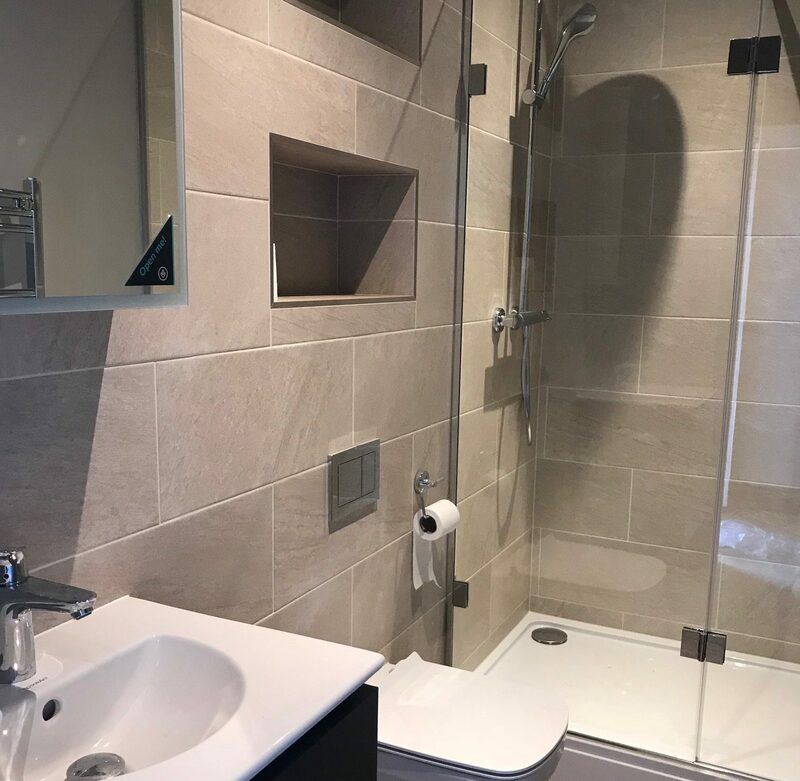 We then chose the grey tiles to complement the floor colour, keeping the style simple to not clutter the design up and the warmer tones help to give the bathrooms an inviting cosy space. The designs we used were the same throughout the flats, this kept a feeling of continuity throughout the building and cut down on design time for the client. We decided to install showers throughout the bathrooms, this was after we conducted research into which young professionals prefer, a good shower was by far the winner! When it came to designing the kitchens, we created a space which is modern and open, but also works well on a practical level too. The colour scheme again was a simple stylish homely feel. In terms of appliances, we opted for Bosch induction hobs, these are easier to keep clean, but they also reduce the fire risk compared to gas hobs. We complemented this with Bosch built-in ovens and the essential NEFF dishwasher, a must for a busy young professionals. 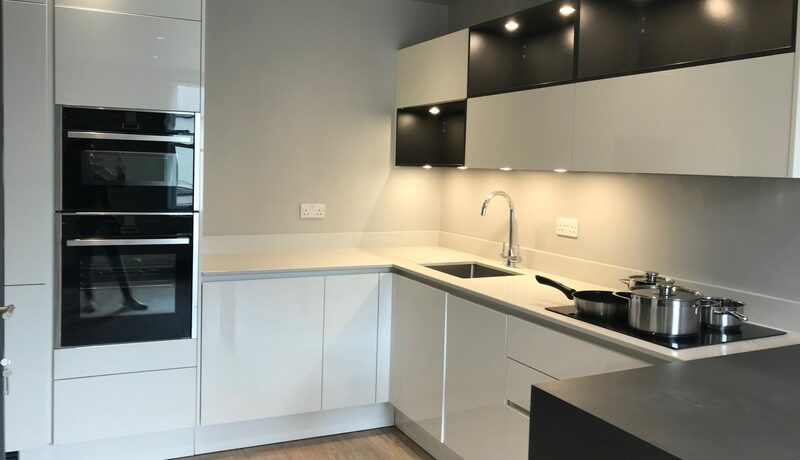 We chose to allow for the maximum storage possible in the kitchens, making plenty of room for storage units on the walls and floors, these all came with built-in LED lighting throughout the units. This was all topped off with highly durable quartz work surfaces and high gloss doors to reflect the light coming into the room. We designed these kitchens and bathrooms so the young professional tenants can come and relax after a long day at work. We’re very pleased with the end result, as is the landlord and the new tenants! If you have any large scale projects that you’d like to discuss with us, please give us a call on 01223 or email [email protected].